Hedges will look spectacular and welcoming when they are neat and tidy. But keeping them this way will always require a fair amount of regular maintenance. With a good pole hedge trimmer, maintaining your hedges and yard, in general, should be a lot easier. However, with the mixture of odd angles, heights, and different hedge shapes, a pole hedge trimmer is often a much better tool for the job. Pole hedge trimmers are just the same as the regular single or double-sided trimmers but with a pole to help make cutting high and low hedges easier and with minimal strain on the back. These hedge trimmers also help to eliminate the need to use a ladder and because you can angle the cutting bar, you also work faster regardless of the height or angle. Because these hedge trimmers do a much better job than most other types, they are quite popular and are available in various models and brands. In this guide, we help you get the best pole hedge trimmer by reviewing some of the top-rated ones, and with our detailed buying guide. You can also read other product reviews such as electric hedge trimmer, gas hedge ttrimmer, trimmer line, string trimmer head, Hitachi CG22EAP2S1 gas string trimmer, weed eater. A good pole hedge trimmer is always handy to have around. And because we know there are many good ones out there, we help you narrow down your choices by comparing 7 top rated pole hedge trimmers. Earthwise CVPH43018 is a highly versatile hedge trimmer that will work as both a pole hedge trimmer and a handheld one. And you can switch between the two at the click of a button. This hedge trimmer also features a pivoting and 6-position adjustable head that makes it easy to cut odd angles and the hard to reach areas. It runs on a powerful 4.5-Amp motor and with an 18-inch long blade, and it is designed to provide up to 13 feet of overhead reach. Also, the Earthwise CVPH43018 is the lightest model on our pole hedge trimmer reviews as it only weighs 6 pounds. If you also factor in the comfortable handle that helps to minimize hand fatigue and the instant starting engine, you have a very convenient yard maintenance tool. Greenworks is always a great brand to turn to when shopping for the best cordless pole hedge trimmers and their 40 Volts model 22272 proves why. It uses a 20-inch long blade that makes it possible to cut large sections with every pass, and it also has a pivoting head that will adjust to different positions to cut the hard to reach areas. For a battery-powered pole hedge trimmer, it is also relatively lightweight. Also, it comes with both the battery and charger to make it ideal for immediate use, and with an onboard battery level indicator. This pole hedge trimmer will also not lose power even as the battery drains, and so you can be confident of always getting a smooth operation. And it is relatively quieter and easy to start. Sun Joe SJH901E is a top-rated pole hedge trimmer that runs on a 3.8-Amp motor and with an 18-inch long hardened steel blade that is designed to reach higher and cut large section with every pass. Although the 3.8-Amp motor is not the most powerful, it will still deliver more than enough power for regular hedge trimming tasks. This electric pole trimmer also comes with multiple positions pivoting head that will allow for precise trimming of most tall hedges and bushes as it can reach all those odd angles. For those that prefer to use the telescoping pole hedge trimmers, this is also a great buy as it has a telescoping pole that will provide up to 13 feet overhead reach. And it also comes with a quick release strap and safety button that will ensure that you always get an easy and safer operation than when using many other pole hedge trimmers. You will never waste any of your precious trimming time trying to start this hedge trimmer as it is designed with an instant start button. In your search for the best pole hedge trimmers, DeWalt should be one of the brands at the top of your list as they are highly reputable and famous for making high-quality power tools. Their DeWalt DCHT895M1 battery-powered pole hedge trimmer lives up to this reputation as it is not only highly powerful (thanks to the brushless motor) but also delivers longer runtimes. With the battery fully charged, you will get up to an impressive 90 minutes runtime which is enough for you to trim large sections. And it also comes with a relatively longer 22-inch blade that will cut large sections with every pass. The pole hedge trimmer produces relatively low noise and it will start instantly. There are many things that make the LPHT120 from Black &amp;amp;amp; Decker a great pole hedge trimmer but many users seem to love the fact that it produces minimal vibrations when in operation. This 20 Volts battery –powered pole hedge trimmer uses a 22-inch long blade which is one of the longest on our list, and it will cut significantly lager sections with every pass. It uses a 180-degree pivoting head that is lockable in five positions, and it will make it easy to trim the top, bottom and behind a hedge, and it does all this cleanly and precisely. Comfort and ease of use also make it great for working on those hard to reach places and for extended use. And there is also a lock-off switch button on the trimmer for safety as it helps prevent accidental starts. If you are on the hunt for a pole hedge trimmer for cutting tall bushes and hedges around your yard, the 4.0-Amp corded electric SJH902E will be a good buy for you. It uses a 21-inch hardened steel blade that will cut into both soft and hard branches with ease. This dual action blade is designed to deliver both optimal cutting performance and enhanced durability. Like most other high performing pole hedge trimmers, it also uses an adjustable pivoting head that will help you get under or above most bushes and hedges. This head design also offers controlled and precise trimming. There is also an ergonomic handle and a shoulder strap that provide easy, comfortable and safe operation even when using the trimmer for extended periods. And the instant starting ensures that you can start the tool fast and easily regardless of the weather condition. With the multiple angles pivoting head on this pole hedge trimmer that is lockable in 6 different positions, you can use it to trim almost any angle. It is also one of the most powerful models on our list thanks to the 4.8-Amp motor. And it uses a laser cut hardened steel blade that offers both precision and durability. The 20-inch dual action blade has a 3/4-inch cutting capacity and will not only cut smoothly and cleanly but also with minimal vibrations. And with the soft rubber grips on this hedge trimmer, you can also be confident of minimal vibrations as they will absorb most of it for a more comfortable operation. If you have a large yard with tall hedges and odd angles, a pole hedge trimmer is a must-have. But, you still need to make sure that you get the best one from the many models out there. Finding a good pole hedge trimmer can be a daunting task as there are many of them out there with fancy features and specifications. However, keeping the following points in mind when shopping will help you narrow down your options. When it comes to buying a pole hedge trimmer or any other type of these handy trimmers, one of the first decisions that you need to make is the power source choose. Here you will have to choose between two general categories which are electric and gas-powered pole hedge trimmers. Before you make this important decision it is vital to understand what each has to offer and both its advantages and disadvantages. Electric pole hedge trimmers are the types that use electric current as their power source and you can categorize them into cordless and corded electric models. The corded-electric pole hedge trimmers are the most cost-effective type, and also often the lightest and hence easier to handle. However, they require a constant plug-in to operate, and the presence of a cord limits their range. Cordless electric pole hedge trimmers run on batteries and so they are more portable and you can use them anywhere as long as the batteries are charged. However, the need to recharge batteries leads to longer downtimes. Generally, both types of electric pole hedge trimmers are quieter than the gas types, will not produce any obnoxious fumes, and also require relatively less maintenance. The fact that it also provides a super quiet operation and comes with a cover for the blade also helps to make it one of the best electric pole hedge trimmers out there. Gas pole hedge trimmers run on gasoline and they are the most powerful of all types. These hedge trimmers can handle any trimming task whether you have a small or large yard. They will cut through thicker branches easily and faster than any other type. And unlike the electric types, there is no cord that requires constant plugging in or can get tangled or a battery that requires recharging. Some of the hedge trimmers will use 2-stroke engines that require an oil and gas mix while modern ones use 4-stroke engines that will only need gas. However, just like the electric types, even the best gas pole hedge trimmers have some demerits. Key among them are the facts that they tend to be noisy, heavy, produce vibrations and the burning of fuel results to exhaust emissions. Using a pole hedge trimmer might take some strain of the back but it can still cause a lot of fatigue, and this is more so when you have a long trimming job. It is important to always remember that the heavier the trimmer the faster it will tire you out, and so you are unlikely to complete the trimming task at hand. Hence, before you settle on any pole hedge trimmer you should be aware of the weight and go for one that is as light as possible. But, also make sure you do not compromise on the power and built quality just to get something lightweight. A good pole hedge trimmer is one that is straightforward to use whether you have prior experience with similar tools or not. Ease of use begins with how easy it is to start the engine and wield the tool. Gas-powered models are the most problematic to start but modern ones address this problem with quick-start features. For the electric types, starting the trimmer only requires you to push a button. Also watch out for other things like vibrations, balance and the type or quality of the handle as they affect user comfort and ease of use. Warranty is and should always be a key consideration when buying any tool and the pole hedge trimmer is not an exception. A warranty is often your only assurance that the tool will last for long and give you value for your cash, and so the longer the better. Typically, pole hedge trimmers will come with a 2-year warranty which is often good enough. But, also be aware of some of the terms of the warranty such as the fact residential ones are not meant for commercial use, and this kind of use can invalidate the warranty. Getting the bushes and hedges in your yard to look neat and pristine will take a lot of effort and time. But, with the right pole hedge trimmer, the job will always be faster and easier. There are plenty of pole hedge trimmer models in the market, and if you know what to look for, finding that perfect one for you should be easy. All it takes is to first understand your needs and the yard size and consider factors like power source, weight, and warranty. 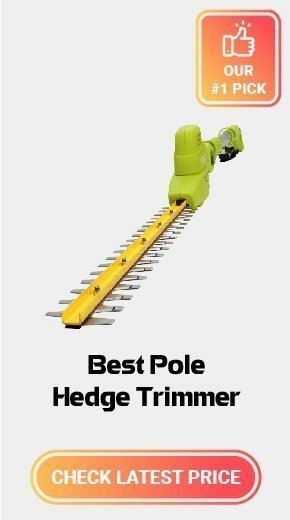 You will also not need to shop around a lot as our 7 best pole hedge trimmer reviews above will provide some high-quality recommendations.